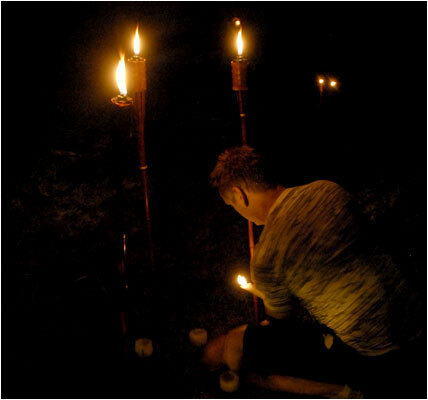 In January 2009, Boho completed a 4-week residency at the Manning Clark House Scholarly and Cultural Centre to research and devise an interactive installation performance entitled Food for the Great Hungers, based on Complex Systems science and Australian history. This process was supported by the Australia Council Inter-Arts office, the Manning Clark House Scholarly and Cultural Centre, Leximancer Software and the Foundation for Young Australians’ Hunting Season. 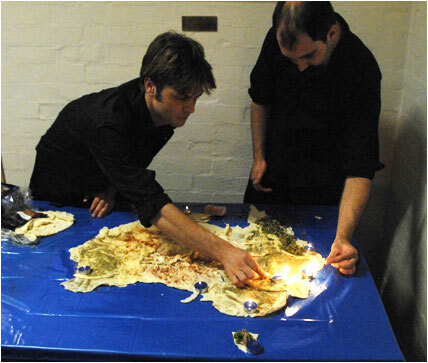 Hungers used techniques from Complex Systems science to create a simulated re-imagining of Australian history since 1901 under the audience’s control. Using an array of purpose-built interactive devices, the audience revised and altered Australia’s response to the challenges and crises of the 20th century, exploring a range of alternative Australias to answer questions such as: how did our society grow and evolve over the decades and centuries? Is Australia’s unique culture the result of decisive action on the part of its leaders, the physical geography of this continent, or merely due to chance? Imagine dropping grains of sand one by one onto a tabletop. The pile builds up slowly into a little sand mountain. The grains are held in place by friction. At a certain angle, friction is no longer able to restrain the motion, and the avalanches commence. Once one grain starts to move, it collides with others and triggers a chain reaction. The avalanche might run out of steam after only a few dozen grains have been set rolling, or it might continue to propagate until virtually the entire slope slides away. Here’s the crucial thing: there’s no telling, when we add a new grain to the pile, whether it will set just a few other grains in motion or trigger the collapse of the entire slope. Big avalanches are less frequent, but avalanches of all sizes are possible. The pile exists in a state of what is called ‘self-organised criticality’. A nation such as Australia also exists in a state of self-organised criticality. New people appear and new events occur continually in Australia’s history. Most have no effect. A few cause a small amount of change. And very rarely, a person or a decision takes place which causes the whole country to move in a new direction. Looking back, we are tempted to ascribe great importance to those few people and events that triggered great changes. We forget that at the time, they were just are of the many potential catalysts. When the system is poised on the brink of change, it takes only the slightest push to drive it in one direction or the other. The fall of a grain of sand can be enough. Since the late 1970s, Complex Systems Science (CSS) has been bridging the gap between natural science, social science and the humanities. Complex Systems are distinguished by two properties: Emergence and Self-Organisation. Human societies are quintessential Complex Systems. Since its coelescence from other disciplines in the 1970s, the study of complex systems has provided insights into areas as diverse as Neuroscience, Psychology, Physics and Economics. The dynamic of history has traditionally been explained as a series of entirely contingent events – in Henry Ford’s words: ‘one damn thing after another’ – or as an inexorable progress or series of waves. CSS is showing us how general rules governing interaction between individuals set the bounds in which contingency plays out. CSS studies the interactions in small groups using Game Theory and in whole societies using Social Network Theory. Fundamental properties of networks help explain sudden shifts in public opinion and attitude, such as patriotic tides in wartime, and their subsequent retreats.